Quick overview A guide to becoming a successful speaker. It offers advice on how to: keep audiences engaged; prepare, plan and structure; use visual aids; inspire your listeners; present at work; make wedding and social speeches; and, understand body language. Whether writing a best man's speech or putting together a presentation at work, "Speech-making and Presentation Made Easy" is an invaluable guide to becoming a successful speaker, with easy-to-use, practical advice on how to: keep audiences engaged; prepare, plan and structure; use visual aids; inspire your listeners; present at work; make wedding and social speeches; and, understand body language. Max Atkinson's "Lend Me Your Ears" provided a sound and thorough manual to public speaking. 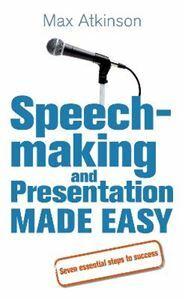 Now, with "Speech-making and Presentation Made Easy", everyone from any walk of life can pick up quick tips for fast-track speech-making.